← Happy Birthday to Paul! 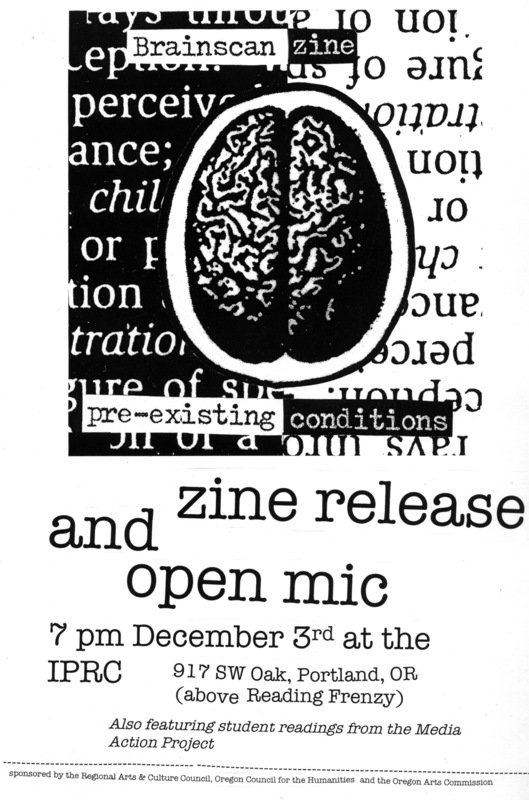 This entry was posted in zines and tagged brainscan, brainscan 25, IPRC, open mic, portland, zine, zine readin, zines. Bookmark the permalink. Good to hear about the zine release and reading. Is it possible to get this recorded and released as a podcast? We’d love to hear it! I hadn’t thought about it but it could be done. Someone else mentioned about having it as a streaming video thing too. Yes, streaming video would be even better! Hearing/seeing someone read their work adds so many additional layers to what is written/printed. So if there is ever an option to record the readings you do, please consider it as it gives your readers the opportunity to experience Brainscan even more.